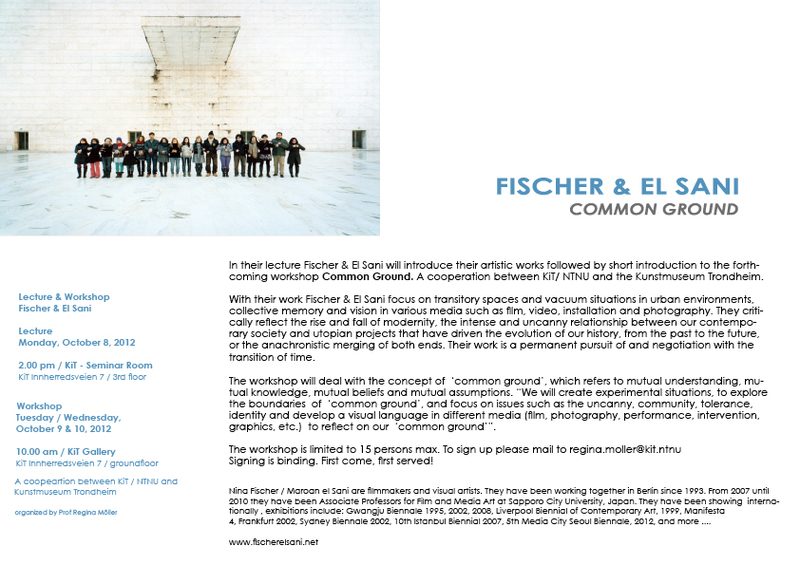 In their lecture Fischer & El Sani will introduce their artistic works followed by short introduction to the forthcoming workshop Common Ground. A cooperation between KiT/ NTNU and the Kunstmuseum Trondheim. With their work Fischer & El Sani focus on transitory spaces and vacuum situations in urban environments, collective memory and vision in various media such as film, video, installation and photography. They critically reflect the rise and fall of modernity, the intense and uncanny relationship between our contemporary society and utopian projects that have driven the evolution of our history, from the past to the future,or the anachronistic merging of both ends. Their work is a permanent pursuit of and negotiation with the transition of time. The workshop will deal with the concept of ‘common ground’, which refers to mutual understanding, mutual knowledge, mutual beliefs and mutual assumptions. “We will create experimental situations, to explore the boundaries of ‘common ground’, and focus on issues such as the uncanny, community, tolerance, identity and develop a visual language in different media (film, photography, performance, intervention, graphics, etc.) to reflect on our ‘common ground’”. Signing is binding. First come, first served!